I love these face masks more than I love most people, TBH. Hey everyone. I'm Sam and recently I've become one of those people who deems themselves a face mask lover. My obsession with face masks started a couple months ago when I bought a few face masks as a gift for my mom who doesn't use face masks and told me she didn't want them (LOL, whoops), so I decided to try them out myself! I've tried different kinds of face masks — charcoal, clay, mud, fruity-scented peel-off masks, 24K gold, multi-system masks, etc. 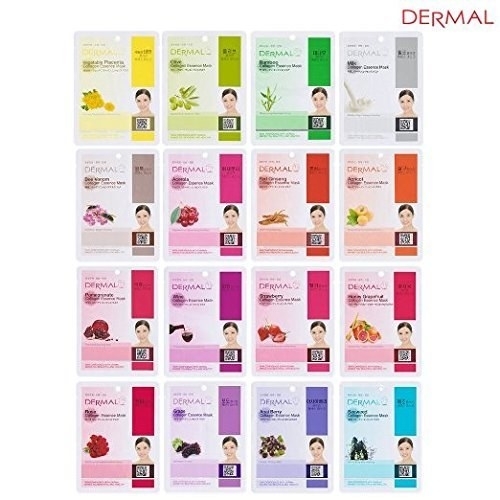 But I'm here to talk to you about these Dermal Korea Collagen Essence Sheet Masks that have literally changed my life. They have over 3K reviews on Amazon and 4.3 stars! Plus, they get the thumbs up from Fakespot. Before trying these, I was super nervous. I have EXTREMELY sensitive skin, and—usually—trying new products ends up being more of a negative experience than a positive one for me. In fact, I was really close to giving up on face masks for good. I loved the idea of using them, but most of the ones I had used before left my skin irritated, red, itchy, stinging, and caused breakouts here and there. But I combed through some of the reviews and took my chances. Not only do these face masks have ZERO negative effects on my skin, they actually have POSITIVE effects! They hydrate my skin and leave it feeling firmer. I actually love them SO MUCH that I am willing to share this awksauce selfie of me wearing one. And they are SO easy to use! I cleanse my face with warm water, put this on and center it so the open areas fit around my eyes and mouth, sit with it for about 15–20 minutes (usually while binge-watching Queer Eye and thinking about how proud Jonathan would be of me), then I take it off, throw it away, and massage the remainder of the essence into my face until it's fully absorbed. Bonus! They're just so relaxing to use! Between balancing work and a social life, having an veryyyy long commute, and spending weekends running errands, I've truly come to love the half hour I can spend relaxing with my face mask on a Sunday night. ANDDDD THEY'RE SOOO REASONABLY PRICED! I used to buy individual sheet masks for $2+ each. 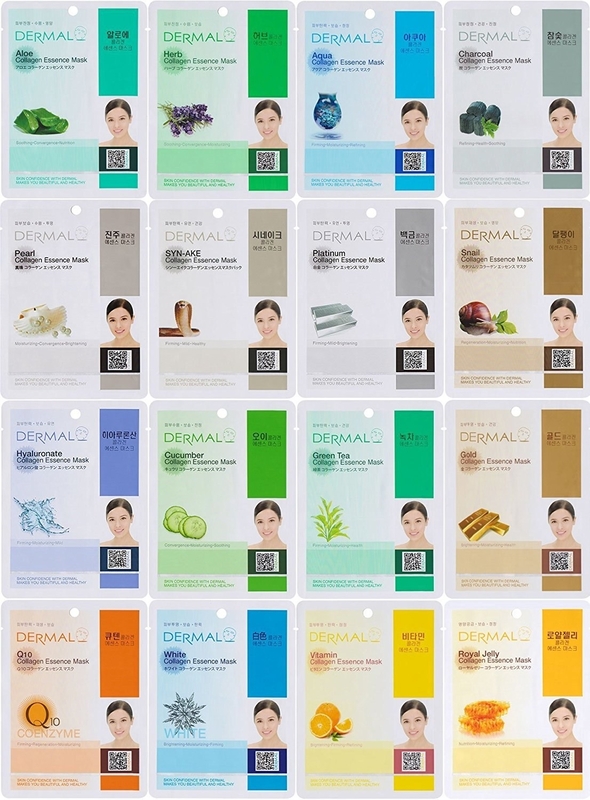 A 16-pack of these sheet masks is $10.70 on Amazon. That's roughly $0.67 per mask! But don't just take it from me. 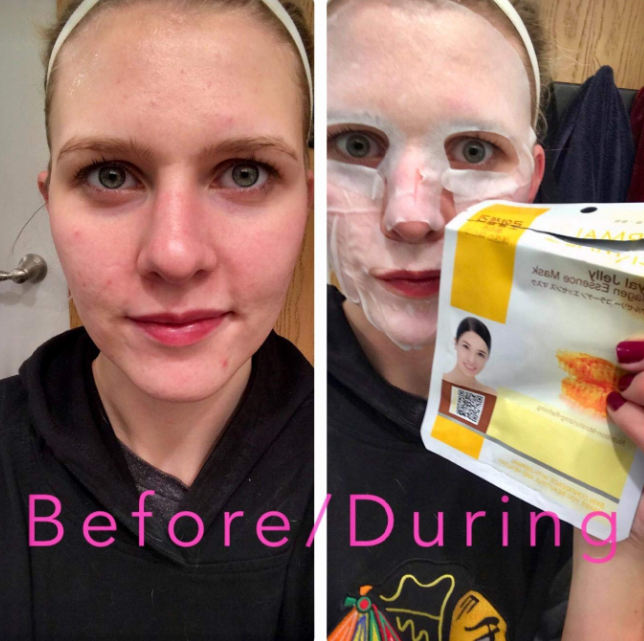 Check out this Amazon reviewer's awesome before-and-after photo and read how the mask made her skin so much brighter and reduced some of her redness! Just after one use! Promising review: "I’ve been eyeballing these, but was skeptical because for the price they seemed too good to be true, but they had so many good reviews I went for it and I’m glad I did. The winter is not good to my skin, and even with daily moisturizing, I was getting a lot of dry flaky patches. 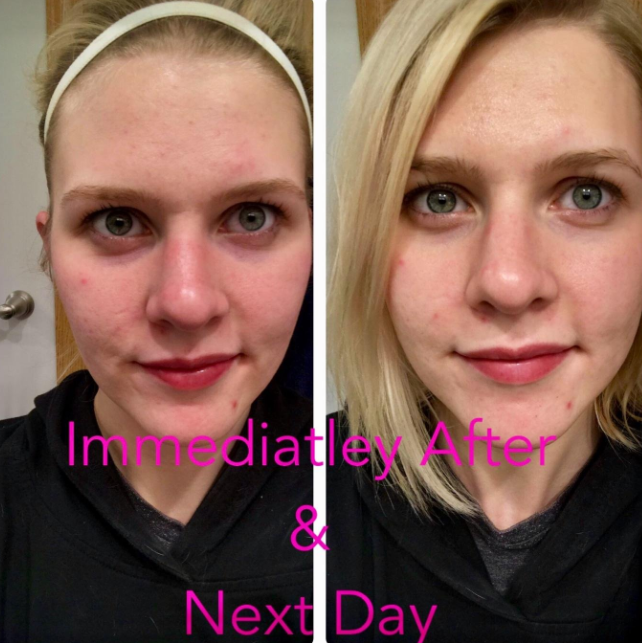 They are hard to see in the pictures, but after one mask for 15 minutes, the dryness was 100% gone and my skin felt really soft! I also think it got rid of some of the redness in my cheeks. It didn’t seem to do much for the acne blemishes I have right now, but they are advertised as being more moisturizing and restorative and because I have sensitive skin, the fact that the mask didn’t make the breakouts worse is still a huge win in my book. And this reviewer can also personally attest to how great they are on sensitive skin. "I have extremely sensitive skin. I look at oil and break out. I am careful about how I cleanse and how I moisturize, as one misstep means weeks of recovery. I threw caution to the wind with these, and I am obsessed. I have so many of these now. I do them about five times a week. They feel great, moisturize, and smell amazing. They are delicate and lovely." —Megan D.
Overall, they're just fabulous. And obviously hella fun to take selfies with. So, to recap: They're gentle (if you have sensitive skin like me), ultra-hydrating, hella easy to use, affordable as heck, and beloved by MANY. DO YOURSELF A FAVOR AND BUY THESE SHEET MASKS! Get them from Amazon for $10.70+ (available in two varieties) and happy pampering!